Generally speaking, the same principles can be applied to knees and elbows. Below is an example of a knee joint. In the illustration below, the green leg represents a poor geo layout, and the gold leg represents a good geo layout. What's the difference between the two? Notice the blue highlighted loops around the knees: the loop goes around the entire green leg, and on the gold leg is terminated before it wraps around to the back of the knee. By giving that joint a horizontal edge to bend upon on the green leg, I have given it a place to collapse upon. 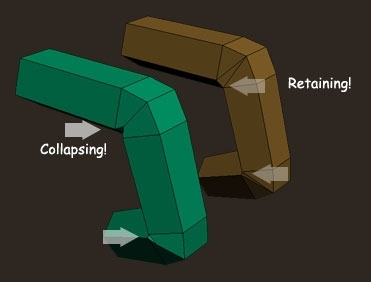 In the illustration below, notice how the gold leg retains it's shape through flexion, while the green leg collapses along that central edge as it bends (hasn't even bent that far!). These are very low poly examples, however the collapsing only increases as you add more and more polys into the equation. 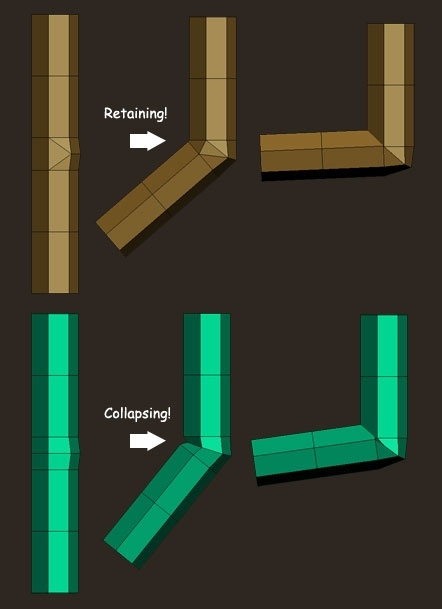 Better deformations for fewer polys- how economical! 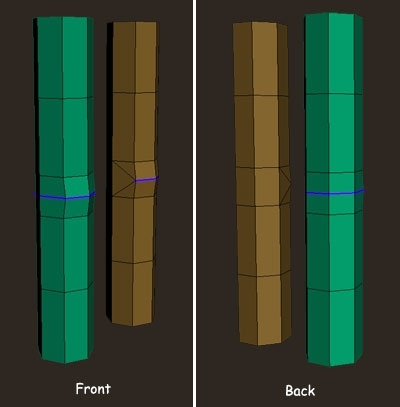 Solution 2 is the overall preference for animators and modellers while we still don't have movie quality geometry. It causes less problems in the long run. It also allows for more variety if you are using the same base mesh for several different characters. 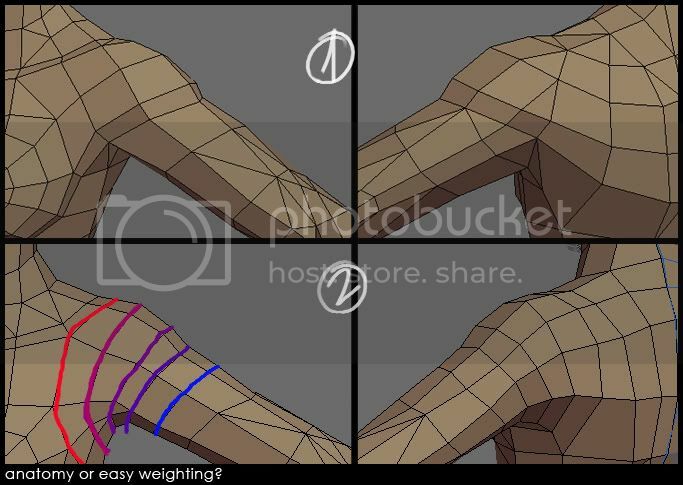 If the rig is complex enough then you might afford to go more towards version 1 since you will have more room for extreme deformations and better weighting. Always check with the TD before making a choice! If you have the budget for a character of over 6000 triangles you might be able to do go more towards the anatomically correct version. Fingers are very similar to knees and elbows in regards to how they hinge in one direction, so the core structure around the joints is essentially the same. Fingers go through a lot of stress when animated! Something as common as a hand making a fist can look horrible if the fingers aren't structured correctly. When done right, there is no crushing and fewer lighting anomalies. When done wrong, there is a ton of crushing (more joints to bend!) and a ton of lighting inconsistencies across the model. The below illustration represents two fingers at a base geometry level. The green is once again representing a bad layout, and the gold a good one. The loops in question are the ones highlighted in blue, bisecting the knuckles. By giving the knuckles a horizontal edge to bend upon on the green finger, I have given it a place to collapse upon. In the illustration below, notice how the gold finger retains it's shape through flexion, while the green finger collapses along that central edge as it bends.